The song may say it's the most WONDERFUL time of the year... and while that may certainly be true, it's also the most magical time of the year too! I just love watching that magic come to life in the eyes of my children. It's like rediscovering Christmas all over again. These days- thanks to Pinterest and the like- we as parents can find even more fun ways to bring the magic to life. Elf on the Shelf, etc. Still, if you ask me, nothing can quite compare to a message from the big man in red himself. That is just what Package from Santa provides. Start a Magical Christmas Family Tradition That Your Child Will Cherish Forever!Give the one-of-a-kind memorable EXPERIENCE of receiving a Package From Santa! Every Package From Santa includes both tangible & technological delights including: * a personalized Santa Letter that arrives in the mail* a personalized VIDEO starring your child via email* a personalized PHONE CALL* a personalized printable NICE LIST GUIDE* and the option to upgrade with MORE goodies! My kids recently got to experience Package From Santa for the second time, and let me tell you... this year was just as exciting for them as last! They loved taking out each and every piece and admiring how their names graced the pages. It was personal, it was just for them. Of course, the highlight is certainly the letter. One of the things I love most about these letters is the wide variety of options available. Have a kid losing their belief? There are letters for doubt. Have a kid who is not feeling well? There are letters for that. Want to be sure that you are keeping Christ at the center of your holidays? There are letters for that. There are even letters for 'naught kids' to encourage them to turn their attitudes around before the big day arrives... though I must admit I couldn't quite bring myself to go with one of those. Within the letter, you can make any changes that you would like. It's a great way to acknowledge their accomplishments throughout the year. This year, Santa congratulated my son for his turnaround at school as of late. Oh the smile that this brought! I only wish I'd had the forethought to turn on a video camera before he started reading. Likewise, it can be a cute reminder of some things they need to work on as well. The Silver package offers a lot of fun pieces to bring the Christmas magic to life, but you can find a great variety of add ons too, if desired. It truly is a great experience that your kids will treasure! 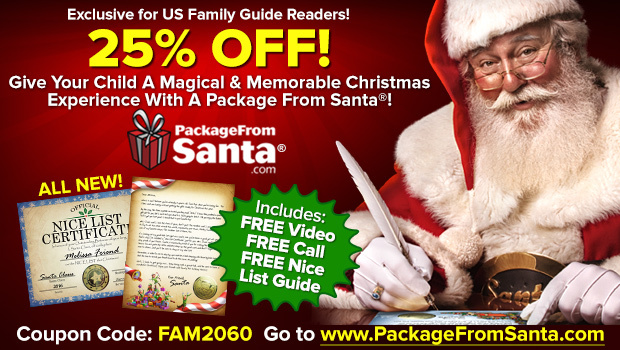 And even better, you can SAVE 25% Off Any PackageFromSanta.com with Promo Code: FAM2060. Hurry over and grab yours today!